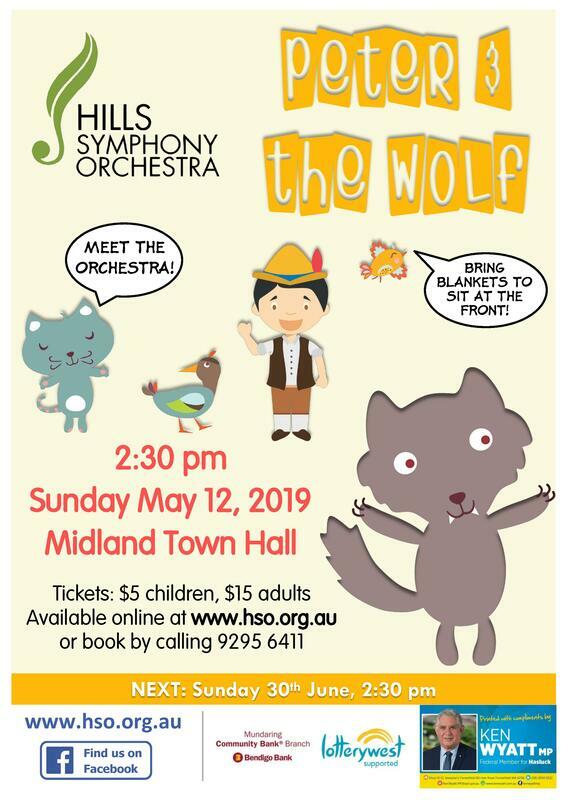 A family-friendly show featuring the classic symphonic fairy tale 'Peter and the Wolf' and excerpts from 'Carnival of the Animals'. Introduce young people to the orchestra, or simply relish the nostalgia. As a special Mother's Day treat, mums with kids get free entry and refreshments. Tickets can now be purchased online securely and easily. See below for alternative booking details. Download the flyer to share with friends or print out for your fridge! Ticket prices for 2019 will be $15 for adults/concession and $5 for children. During interval, refreshments will be available at the venue for a gold coin donation. In keeping with the spirit of the Hills Symphony Orchestra, we have tried to keep the prices as low as possible so that many people can enjoy our music! Tickets can be purchased securely and easily online via TryBooking. You don't need an account or password to purchase tickets, and all transactions are secure and safe. Tickets are also available at the door, although purchases must be made with cash as we regretfully do not have EFTPOS facilities. To reserve door tickets in advance, call the Mundaring Community Bank Branch Bendigo Bank Admin office on 9295 6411, during office hours. All upcoming concerts listed below will be held at the Midland Town Hall. Classical music that inspired pop tunes. An introduction to the orchestra featuring this iconic fairy tale.